Hologram sticker Version 13 Tamper-proof holographic sticker's hologram image cannot be removed without being destroyed. Then sticker can not be reused anymore. Designation : 'Security'. The price is for a list. These holograms are the result of designs comprising many tiny dots, where each dot is a separate diffraction grating. 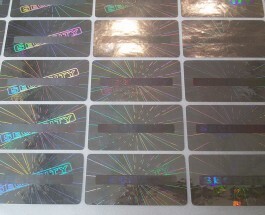 They create a beautiful impact of variable images on hologram sticker. 2D/3D Hologram is made up of multiple two dimension layers with images visually placed one behind another with visual depth to produce an effect of three-dimensional structure on sticker. It has very good visual depth between different layers and shininess on first layer.